I promise I am a fun person. I just lack pictures as proof and can’t blog without them. Or shouldn’t, anyway. When I write aimlessly, I tend to subject you to rants discussing McDonald’s delicacies and my friend getting ran over, and we’ve all had just about enough of that. But, I’m a mature person and this has a point. Brian and I have been making the rounds with little two day road trips. Most recently, we went to his family’s house to say, “ADIOS!” to his little brother, Reece. He just left yesterday for a mission in El Salvador. I don’t know how moms do it…it’s so hard to let them go for so many reasons! Whether or not people in El Salvador are accepting of his message, I just hope people are respectful and kind. Please love our brothers and sons while they are away from us for so long! Please please please take care of them! Have I ever mentioned my in-laws? They’re so fun and we wished we lived closer. Maybe then I’d have ohhhh…two pictures of/with them? Any of them? Is that so hard to do? Anyway, we loved being with everyone for the quick two days we were in Arizona. We were almost roommates with Courtney, Landon, and Grant this summer…almost. Speaking of family, don’t you love that sense of belonging being with your whole entire family gives you? You know, the kind that makes you feel like you just drank hot chocolate? You’re unconditionally welcomed, you never have to explain yourself, and they know how you are feeling before you even talk. You’re flaws are all out in the open, everyone knows your embarrassing stories, you forgot to wear deodorant, and your family still want to know if you want a Coke or lemonade with your burger. Not only did I get to enjoy that feeling last weekend in Arizona (I wore deodorant), I was also able to go to my cousin Austin’s wedding this weekend (CONGRATULATIONS! ), and I loved just being a part of everything. I loved getting to be “a cousin,” and showing up to a reception with more than a dozen other people who I’ve grown up with and know almost as well as my brothers and sister. Mi Amor was there, too (we spoke to each other in English rather than Spanish so others wouldn’t feel excluded from our Spain adventure). I was not Ashton, I didn’t have a last name, I was merely “an England.” And I belonged right there. Good luck Reece! We are so proud of you!!! I may sound like a fanatical sister in law, or a mom writing a graduation message, but maaan..missions are a lot of work. Brian and I are sincerely proud to have another brother out (and only one more to go)! You tell me. These have been topics of several salon conversations with clients, and I’ve been having an exhausting inner debate ever since. 1. Shopping at Forever 21. 2. Letting your kids listen to rap so they can cutely “sing” to Lil Wayne or Flo Rida. 3. 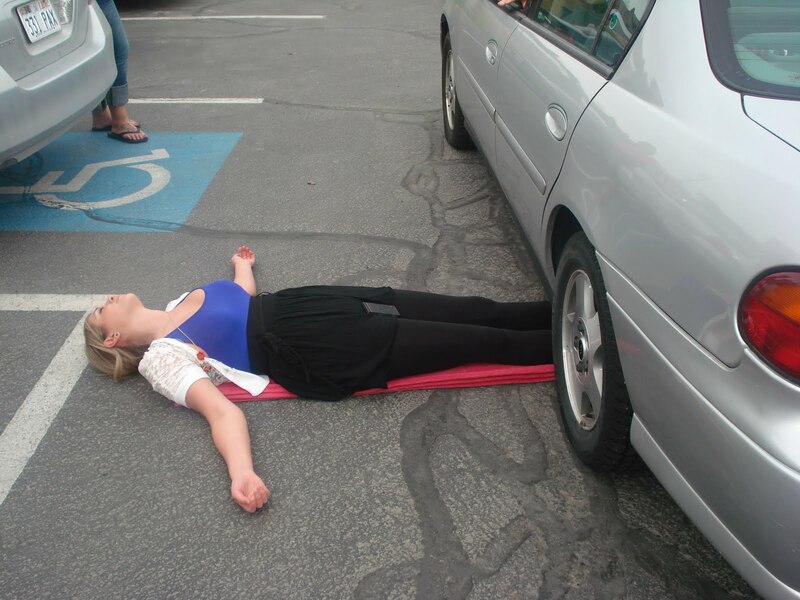 Re-enacting getting run over by a car on the anniversary of when you really did get run over by a car. 4. Leaving tags on your clothes, wearing them, then returning them (disregard the dishonest part). 5. Returning ANYTHING to Nordstrom. 11. Only getting a few squirts of gas instead of filling your whole tank. 12. Trying new haircuts on your husband. 13. Being friends with Kanye West. 14. Purchasing popcorn at movie theaters. 16. Spending New Year’s in Time’s Square. 17. Booking Caribbean vacations during the fall because it’s cheaper…because it’s hurricane season. 18. Buying a cubic zirconium instead of a diamond ring. I'm on the fence about all of the above. Minus #5, although one of my clients has a convincing rebuttal.